The Supercharger Kits described below are unfortunately no longer available. Described below is the supercharger kit that we developed starting in 2000 and offered for many years after. It was a great project, that demonstrated what could be done and the level of performance that could be achieved from an old Volvo b20 engine. In the future tis possible that we may do a few custom supercharger installations, but this will be on a very limited and exclusive basis. As an alternative, we now offer larger displacement normally aspirated B20 engines that produce more power than superchargers installed on stock engines. Below is the information on the last kits offered, to be used as a reference. The Supercharger System Kit for Volvo B18/B20 engines comes complete with Autorotor Supercharger, Laminova 3 tube water to air intercooler, Nissens intercooler radiator, new custom modified Mikuni carb for the carbed version, and all other parts needed to make this a bolt on kit. The fuel injected version does not include the programmable fuel injection system which is needed to replace the original D Jet system. Recommended FI systems include Megasquirt and Simple Digital Systems. Prices for the complete supercharger system are $4195 for the Mikuni carbed version, $3595 for the fuel injection ready version without throttle body, and $3895 for the fuel injected version with throttle body and linkage, including recent upgrades, plus $75 in refundable core charges. Currently, no further supercharger orders are being accepted for the .87 liter displacement supercharger until more are available from Autorotor/Lysholm. However there is a good supply of the slightly smaller .76 liter compressors and these can also be used in our kits. Below is the supercharger section from our old website. 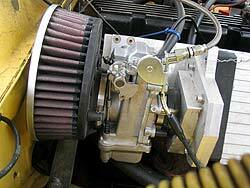 In the spring of 2000 I began testing a modern, positive displacement, belt driven supercharger on a 1968 1800. The results were truly astounding and transformed the car's performance. Zero - 60 MPH times were reduced by more than 6 seconds with a stock B18 engine. Since then there have been numerous refinements that have allowed that first prototype to evolve into a bolt on kit available to fellow vintage Volvo owners. In the process we have added a state of the art water to air intercooler as an integral part of the kit. On an otherwise stock B20 in an 1800ES, with modified head and exhaust, the system has been dynoed at over 200 HP at only 8 lbs. boost with 0 - 60 times of under 7 seconds. Our aim in this process was to develop the simplest system possible that would allow vintage Volvos owners to give their cars the performance of modern vehicles, without requiring substantial modifications or changing the essential vintage character of the car. With the supercharger kit, accompanied by recommended suspension and drive line modifications, we are confident that we have achieved that goal. Why a supercharger rather than a turbocharger? There are two basic reasons. First, simplicity - we wanted to make a reliable kit that would be available as a true bolt-on with no engine modifications. Second, driveability - we wanted to produce a system that not only had outstanding performance, but was also easy to drive, with good power throughout the RPM range. Essentially, you don't know that it is supercharged until you put your right foot down. Our supercharger choice is a belt driven, positive displacement, twin-screw, Lysholm principle supercharger, built by Autorotor in Sweden. Extensive research showed that Lysholm principle superchargers provide several advantages over other designs including greater low rpm boost, higher volumetric efficiency, reduced drive power requirement, and lowered discharge temperatures. These superchargers have the highest thermal efficiency of any fixed displacement superchargers available. But perhaps the greatest benefit of the twin-screw supercharger is its inherent ability to produce consistent, high boost pressures across a wide RPM range. Although the high efficiency of the supercharger used allows it to function effectively without an intercooler, developments after doing the first prototype made it possible to incorporate a water to air intercooler into the system. As with the supercharger, the Laminova intercooler cores are a patented Swedish design. Using these cores allowed us to create a package that uses one structural unit for both the intake plenum and the intercooler, saving both weight and space, and increasing both horsepower and reliability at minimal additional cost. 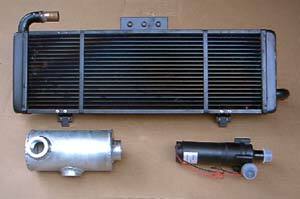 The system uses a small electric pump to circulate water through the intercooler cores and a front mounted radiator. With the intercooler, supercharger discharge air temperatures are reduced. Lower intake air temps mean a denser charge, less chance of detonation, less engine stress and more POWER! Are their disadvantages to this design? One disadvantage is cost - you have to pay for high quality. Being the highest quality supercharger/intercooler combination available, the same as used in various Porsche, Mercedes, and BMW aftermarket installations and the same basic design as used in recently introduced high performance AMG Mercedes models, the choice here was to go for quality rather than the lowest possible cost. However, it is another example of getting what you pay for - the best product for your money, and that is consistent with our product philosophy and Volvo's. 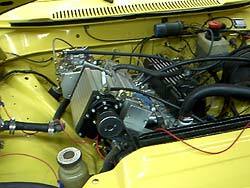 The supercharger-intercooler unit bolts on in place of the stock carburetors or fuel injection manifold. 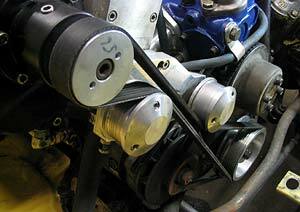 A modified crank pulley replaces the stock pulley and allows the addition of the supercharger drive belt. Oil fittings and lines supplied with the kit provide lubrication to the supercharger drive gears from the engine's oil system. Installation of the whole system requires 4-8 hours depending on skill levels. Installation on fuel injected 1800s and 140s requires a few extra steps, but does not require replacement of the fuel injection fuel pump, lines, filter, etc. If you perform the maintenance on your own vehicle you have the skill required to install this supercharger system, and do it in a day. The system comes complete with a suitably tuned sidedraft Weber 45 DCOE carb, air cleaner, modified crank pulley, belt tensioner, hardware, belts, hoses, connectors and adapters, and is ready to install. Once installed and tuned it is essentially a maintenance free system, other than the routine type of inspection needed for any automotive accessory drive belt drive. The initial kits have been designed for all B18 and B20 engines, whether carbed or fuel injected, but without air conditioning. A second version, available soon, with a modified belt drive system will accommodate air conditioned vehicles. Work on a system that will allow the use of an aftermarket fuel injection system is underway. Continued development and testing will produce additional modifications designed to incrementally increase all aspects of the car's performance. Reservations should be made in advance as kits are done on a custom basis and take approximately 12 - 14 weeks from the date of order to delivery. Costs have gone up due largely to the lower value of the dollar. The current price is $4195 for the new Mikuni carbed version, $3595 for the fuel injection ready version without throttle body, and $3895 for the fuel injected version with throttle body and linkage, including recent upgrades, plus $75 in refundable core charges. The kit comes complete with Autorotor Supercharger, Laminova 3 tube water to air intercooler, Nissens intercooler radiator, new custom modified Mikuni carb for the carbed version, and all other parts needed to make this a bolt on kit. The fuel injected version does not include a programmable fuel injection system which is needed to replace the original D Jet system. Our system uses an Autorotor supercharger of unsurpassed quality, designed and built in Sweden. It is a positive displacement, twin rotor, Lyshom principle supercharger of approximately one liter displacement. The Lysholm principle provides several key advantages over all other types of superchargers: greater low rpm boost, higher volumetric efficiency, reduced drive power requirement, and lower discharge temperatures. This supercharger has the highest thermal efficiency of any fixed displacement supercharger in production in the world today. This efficiency is reflected in an intake temperature rise, before the intercooler, of less than 90 degrees F at full boost and is a key to significantly increasing engine power without over stressing the engine. From the driver's point of view, the chief advantage of this supercharger is its inherent ability to produce consistent boost pressures across its operating range, starting at extremely low engine RPMs. There is no feeling of "coming on the cam," or "turbo lag," only prodigious low end torque that continues as the car accelerates. In tests, full boost has been achieved as low as 1500 RPM. The resulting flexibility in engine operation is clearly unmatched by any other performance system. A supercharger is basically an air compressor. The basic features of this type of compressor are two helical, gear driven shafts, one with concave lobes, the other with convex cavities which intermesh at high speed, thereby compressing the air. It is a positive displacement pump but has no contacting parts to wear out as in the old vane type superchargers. The air is drawn in at one end of the case, compressed between the rotors and expelled from the other end of the case in a fixed ratio. These superchargers have been used in demanding industrial applications for years where extreme reliability and low maintenance were primary requirements. Only recently have advances in manufacturing techniques allowed their cost to be reduced to the level that they can be economically produced for automotive applications where they are considered to be the highest quality supercharger available. The supercharger itself is essentially a sealed, self lubricating unit, with an industrial use rating of 22,000 hours at 15,000 RPM. That translates into more than 1 million miles at 60 MPH before a rebuild would be required. The gears which drive the twin screws do require lubrication. In order to eliminate the need for maintenance, or checking oil levels as in some other kits, our system lubricates the gears using engine oil fed by the engine's own lubrication system. All oil lines and fittings for the lubrication system are included. With an appropriately sized supercharger in relation to engine displacement, boost levels are determined largely by the speed ratio between the supercharger and the engine. As it is a positive displacement supercharger, this is a linear ratio. A 50% increase in the RPM of the supercharger in relation to engine speed will produce a theoretical 50% increase in boost pressure, all other things being equal. See the "drive system" section for more information on changing boost levels. It has now been 7 years since our first supercharger system hit the road. Followed by the intercooled version a year later, it revolutionized the concept of the power that could be obtained from a B18/B20 pushrod motor and the kind of performance that you could enjoy in a vintage Volvo. Since then, changes have been more evolutionary in nature. Development of the system continues and now allows us to produce more power per pound of boost with improved fuel economy. Improvements in cam, head and exhaust design have been essential to this process. One result has been a cam designed specifically for use with the SC system. For 200 HP or more, one of our Street Performance Heads is a necessary element. Customers using other ported heads have not been able to achieve the same power. In the beginning, producing power was almost the only consideration. But having met our original performance goals, the goals for the system have broadened, with improvements in long term reliability and fuel mileage becoming more important than power increases. To implement these improvements, changes to the system include CNC machined aluminum crank pulleys, a spring loaded belt tensioner system for the drive belt, new anodized aluminum idler pulleys of our own design, and an intercooler radiator 40% larger than the original. But the most significant change to date is in the carburetor. We now use a modified version of the same HSR 45 Mikuni described above as an "SU replacement," and use it to get an increase of more than 50% in cruising fuel mileage. With this carb you no longer have to sacrifice fuel mileage when you opt for supercharger performance - cruising at 25 mpg is routine. With normally aspirated B20s available with power in the 150 - 200 HP range, our basic recommendation is to reserve supercharging for those customers who want at least 180 HP. We also recommend that all supercharged cars have suspension upgrades and other modifications that are necessary to safely accommodate power levels that will completely transform your car's performance. For those who want to use fuel injection, and it is recommended for anyone with a car that currently has FI, we offer a "fuel injection ready" version of the supercharger system. No, it does not include a fuel injection control system. And, no, you can't use it with D-Jet. But you can use it with your stock injectors, fuel rail, fuel pump, fuel lines and fuel pressure regulator. Since we now offer the fuel injected version with an adapter plate, Mustang throttle body with TPS, and throttle linkage, you can now install Megasquirt or Simple Digital Systems, etc, instead of the D-Jet ECU, sensors and wiring, and you are ready to go with a fuel injected supercharger system. See Steve Berry's website www.1800philes.com and an article he wrote that appeared in the Nov. 2006 issue of Grassroots Motorsports magazine for details on using Megasquirt with our supercharger system. Steve also has an S60R, and says his supercharged 1800, even at midrange boost settings, is faster. And for those of you who insist on ruining the traditional sports car experience of being either too hot or too cold by insisting on air conditioning, for 2006 we will have a kit that will allow the supercharger system to be used with AC. Our original power goal with an otherwise perfectly stock engine was 150 HP. The next goal, with a modified head and exhaust system, was 200 HP at 8 lbs. boost, then 250 HP at 15 lbs. All were achieved. Then the priorities became refinement, reliability, and fuel mileage. Now, having met our goals in those areas we can turn back to power. So for 2007 our power goal will be double the original: 300 HP from a 2 liter street engine, 3 times stock HP, while still getting 25 - 30 miles per gallon. Check back for details. The dyno chart below shows the power progression from stock engine to the most popular configuration - 10 lbs. of boost producing 216 HP at the flywheel and 221 ft. lbs. of torque. The dyno chart compares tests of flywheel horsepower of a stock 1800ES with three different supercharged configurations. The bottom line is the stock ES. The 2nd line from the bottom represents the same car with stock engine and exhaust system with the supercharger producing a maximum of 7.7 lbs. boost. The 3rd line from the bottom is the same stock engine and exhaust with a different SC drive pulley ratio producing up to 10.5 lbs. boost. The top line is the same car with our performance head, "C" cam, 4-2-1 header, and 2-1/2 inch exhaust system with muffler and resonator at 10 lbs boost, clearly demonstrating that you do not need to increase boost to increase power. This power level in an 1800 is good for 0-60 times in the 5 second range. cooler charge will produce more power than a hotter charge at the same boost level. At the same time a cooler charge reduces the chances of detonation and engine stress. The goal of the intercooler system is to keep charge air temps as close to ambient air temperatures as possible. Coupled with the high thermal efficiency of our supercharger, these temperatures may be as much as 200 deg. F. lower than in other systems. Our intercooler is of the water to air type. 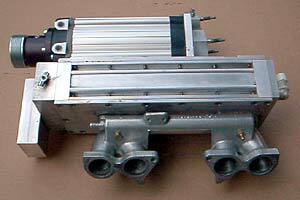 Like the supercharger it is a patented design, using heat exchanger cores made by Laminova in Sweden. Unlike the typical intercooler that uses air to air cooling, it uses water ( or a water/antifreeze mix ) to cool the air compressed by the supercharger. The higher specific heat value of water gives this type of system a distinct advantage in its ability to absorb heat energy, and also allows for a much more compact installation. The system essentially consists of two small heat exchanger units. One is a radiator, mounted in front of the vehicle's normal radiator. There water is cooled by outside air moving through the radiator in the same manner as in the vehicle's cooling system. An electric pump pumps the coolant from the front mounted radiator to the second heat exchanger - the intercooler core - mounted between the supercharger and the engine's intake manifold. Our system uses an advanced laminar flow technology heat exchanger core that allows it to be integrated into the intake manifold plenum without disrupting the air flow. There the compressed air discharged by the compressor is cooled by exchanging heat with the liquid coolant in the core. As it is inside the plenum, the intercooler core takes up no additional space and allows for the creation of an extremely compact unit mounted between the supercharger and the engine. Brackets, hoses, an electrically powered water pump (also made in Sweden), and an aluminum expansion tank are all included in the kit and are easily installed. The pump is designed to be in operation whenever the engine is on; thus no complicated wiring is necessary. The supercharger is driven by a modern, multi-rib drive belt system running off of the engine's crankshaft. The crankshaft pulley has been modified to accept this belt in addition to the normal fan/alternator belt. 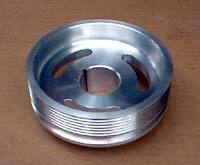 A high quality idler pulley is part of the system. 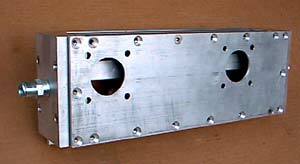 Not only does this provide for positive location of the belt, but it is also used to provide the necessary tension for the belt system. As long as it is properly tensioned, the drive system should not require any more maintenance than any other automotive drive belt system. Modifications to the basic drive system will be made to accommodate air conditioned vehicles. 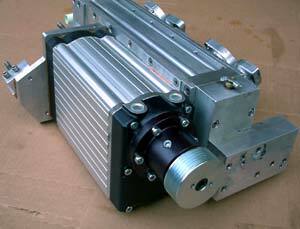 One of the advantages of this type of drive system is the ease at which boost levels can be changed or adjusted. The boost level of the system is based on the speed ratio between the engine and the compressor. The compressor pulley can be replaced with larger or smaller pulleys in order to vary this ratio and therefore the boost level. This change can be accomplished in a few minutes and requires only that the supercharger pulley and the drive belt be removed and replaced by different size units. This allows the user to change the boost level to accommodate various circumstances such as the use of higher or lower octane fuel, or the need for more power for a weekend autocross or track day. Performance testing of the system began in the spring of 2000 with the prototype unit. The test car was a 1968 1800, with completely stock B18 engine and exhaust system. Preliminary tests before installation resulted in 0 - 60 times of 13.5 seconds, essentially the same as the results obtained when the car was new according to contemporary road tests. With the supercharger producing 10 lbs. boost we got consistent 0 - 60 times of 7.5 seconds. After a summer of testing, tuning and minor modifications, further testing was cut short when the parked test car was hit by a drunk driver at 5 AM one Saturday morning. The engine was pulled, opened up and examined. It showed no signs of any problems, even though we had run it with as much as 15 lbs. boost. Although we did not get to complete chassis dyno tests that had been scheduled, we felt we had enough information and test mileage to proceed with the design of a production version. The process of going from prototype to production resulted in several design changes, and the final product is clearly improved, both from a customer value standpoint and improved performance. The inclusion of an integrated intercooler system was the most significant of these changes, but was only one of a number of refinements. The delays apparently typical of the introduction of any new product put us behind schedule in going from prototype to a production version of the intercooled system. Rather than test another prototype we delayed further testing until we could test with true production parts. It took until the fall of 2001 before we were ready. As there was significant interest in adapting the supercharger to injected cars and we wanted to be able to test through a salty northeast winter, I decided to use a recently purchased unrestored 1800ES as the test car. ("I'll sell it to the first person who can pay $750 cash and pick it up before the end of the week" was roughly the way the e-mailed offer read.) The idea was to test the system on a car that is representative of most of those out there, not a "special" with an engine built for this purpose. At times I regretted this choice, as problems not having anything to do with the supercharger system kept cropping up, and more time was spent restoring various parts of the car just to keep it running than were spent on the supercharger system itself. Installation on the ES was very straightforward, and there was no problem at all simply hooking the Weber carb to the injected fuel system with the simple substitution of a fuel pressure regulator with a wider range than the stock regulator. As we intended to do later tests with a FI system instead of a carb, we initially left the injectors and all of their wiring in place, but later removed them as they slowed down removing and replacing the system for further modifications and testing. The series of tests on a Superflow chassis dynamometer started with a pre-installation test of the stock 1800ES for a base line. The result of this test was a peak of 111 HP at the flywheel, 90 rear wheel HP, with stock exhaust, air filter, etc. After the supercharger installation dyno tests with the stock D cam and stock exhaust produced increases in the 40 - 50% range, with 150 HP at 6 lbs. boost and 170 HP at 10 lbs. boost being examples. During these tests it became apparent that power was being limited by the restrictions in the exhaust system as further increases in boost produced negligible increases in power. On the road the test car recorded a best 0 - 60 time of 11.8 seconds before supercharger installation. With the supercharger, modified head and exhaust, we were able to do it in under 7 seconds, but clutch slip with the stock clutch limited the ability to launch the car from a standing start. In order to preserve the stock components, further standing start tests were postponed until drive train modifications were made to accommodate power levels over 200 HP. The supercharged test car has been driven daily for over eight months, and has gone on several trips including a 600 mile, one day blast through portions of New England. Even though the trip included some high speed demo miles and vigorous runs through the mountains, fuel mileage on this trip averaged 18 miles per gallon, with 20 MPG being recorded for the NYS Thruway portions. Power increases of 40 - 50% can be achieved at boosts of 6 - 8 lbs. with an entirely stock engine and exhaust. No special ignition timing controls are needed with low compression engines at boosts in the 6 - 8 lb. range, but may be necessary for high compression engines - above 9 - 1 compression ratio, depending on level of boost, static timing, tuning, cam, and weather conditions. 4) For boosts over 8 lbs. a timing retard system is needed even with compression ratios as low as 8.5 - 1. The stock exhaust system is a critical element limiting the power that can be produced with approx. 170 HP being the power limit for the stock system at boost levels higher than recommended for an entirely stock engine. The stock driveline is adequate for power up to the 200 HP level, but both clutch and overdrive slippage are problems with power above this level. The most satisfying configuration includes a free flowing exhaust, modified head, and knock sensing ignition retard system to achieve over 200 HP. The 200 + HP versions of the system have all of the power I could want on the street. Considering that most early Volvos weigh from 2300 - 2700 lbs., the power to weight ratio of these cars with the supercharger is better than many modern sports cars and sports sedans. In most cases the supercharged Volvo will also have a much broader power band, and this translates not only into ease of driving but better overall acceleration. Coupled to suspension improvements it is probably as close to having my vintage race car on the street as I am going to get, and quite a thrill to drive, especially on the back country roads sports cars were designed for. Hopefully it is a solution for all of those who have said, "I really love my old Volvo, but it just doesn't have enough power." The results of future tests of the car with modified driveline at even higher boost levels will be posted here as the tests are completed. At this point we are only beginning to explore how much power the system will produce with further modifications. We believe strongly in the importance of monitoring engine performance. The 1800ES that is currently being used as the test bed for development of the supercharger system not only has the 1800's normal full compliment of gauges, but also a boost gauge, charge air temperature gauge, intercooler water temp gauge, exhaust gas temp gauges for each cylinder, and a compliment of LEDs. These LEDs indicate the air/fuel ratio and show not only whether there is any detonation/pinging, but also where it is occurring, the frequency and severity. While this type of instrumentation is only necessary for testing, we do recommend that anyone who plans to "push the system" with hard driving and/or engine modifications have water and oil temperature gauges, a boost pressure gauge, and an air/fuel ratio gauge wired to an oxygen sensor in the exhaust system. Using these gauges will assure that the engine is not put under any undue stress and will greatly simplify tuning after the supercharger installation. We can help you by supplying and/or installing any of these instruments. The basic supercharger system was designed as a bolt-on system that takes advantage of the rugged nature of the B18/B20 family of engines to produce significant increases in power while keeping engine stress within limits that will not jeopardize the renowned reliability of these engines. At recommended boost levels, no engine or drive-line modifications are required for power increases of as much as 50 - 60 %. However, we recognize that it is in the nature of performance driving (and human nature) not to be satisfied with the amount of power you have, even though it is a lot more than you used to have. With this in mind, we have built into the supercharger system the ability to upgrade for more power without having to change any of the basic components. A smaller supercharger would have been easier to package, but would not have been upgradeable for higher horsepower applications. An intercooler is a highly recommended performance option on most systems but has been built into ours at no extra cost. Computer controlled ignition systems will allow higher boost pressures to be run by retarding the ignition to prevent detonation. These systems retard the ignition either at a preprogramed rpm, boost pressure, or when detonation (knock) is sensed. We can offer a range of these systems for those want to run higher boost pressures than the standard system. On our test cars we use a small computer controlled system built by J&S Electronics that senses detonation on an individual cylinder basis and retards the ignition timing to that cylinder only, and then only in the amount necessary to eliminate the detonation in that cylinder. Using this system we have run boost pressures as high as 15 lbs. on a stock engine and expect to go much higher. The system also includes a boost level regulated timing retard, rev limiter, and high output ignition. The current price for this ignition system is $495. At some point, the stress that can be produced by high boost pressures is more than can be accommodated by production components. Fortunately, our experience with racing engines puts us in a perfect position to provide the necessary components for ultra high performance applications. Even though our stock test engines have stood up to over 200 HP, we recommend that those who intend to run hard at high boosts do it with an engine rebuilt with forged pistons and other components designed to take considerable abuse. Where appropriate these may include forged pistons, aftermarket connecting rods, etc. See our price list for details on engine options. • Clutch: At over 200 HP the stock clutch slips in the lower gears. We are currently offering a heavy duty clutch disc that will allow the stock type clutch to work at this power level. We also offer race and rally type aftermarket clutch systems. • Differential: With an open differential, standing start acceleration as well as cornering under power is limited by the power going to one wheel. A limited slip differential is the obvious cure and we can supply these for most models. • Transmission: The overdrive slips with sudden applications of power. A transmission swap to a true 5 speed such as a Borg Warner T5 or a Toyota transmission is the answer. Some of these transmissions have an overdrive 5th gear with a lower numerical ratio than the M41 overdrive and should provide for better fuel mileage. • Gearing: Improvements in fuel mileage as well as acceleration through the gears are limited by the high rear differential gear ratios in the various Volvo models. As these ratios are not needed for low end performance with the supercharger system, a change to a lower numerical ratio is recommended. We can provide different ratio gear sets for most rearends. Research has made it clear that the stock D Jet system will not work with forced air induction systems. However, there are several modern aftermarket, programable fuel injection systems available that can be used to replace the D Jet controller, wiring and sensors, at reasonable prices. Testing on the use of this type of FI system is planned. The supercharger system is designed so that the carb can be replaced by FI at minimal cost and use the stock fuel pump, lines and injectors of the D Jet system. It is expected that both power and fuel efficiency can be improved with a modern FI system. Over the next year we will do a little playing and see how much performance we can really get out of the system. As we experiment, additional components we be developed and offered to fill your needs.